Organic Spelt Crusted Mozzarella Balls | ShaSha Bread Co.
1. With some paper towel, gently pat and squeeze the mozzarella balls to remove any excess moisture. 2. In a bowl, whisk together the brown rice flour, egg and club soda so that they are well incorporated. This will be your batter. 3. Spread the breadcrumbs out in a large shallow pan or dish. 4. Roll each ball in the batter before gently rolling in breadcrumbs. 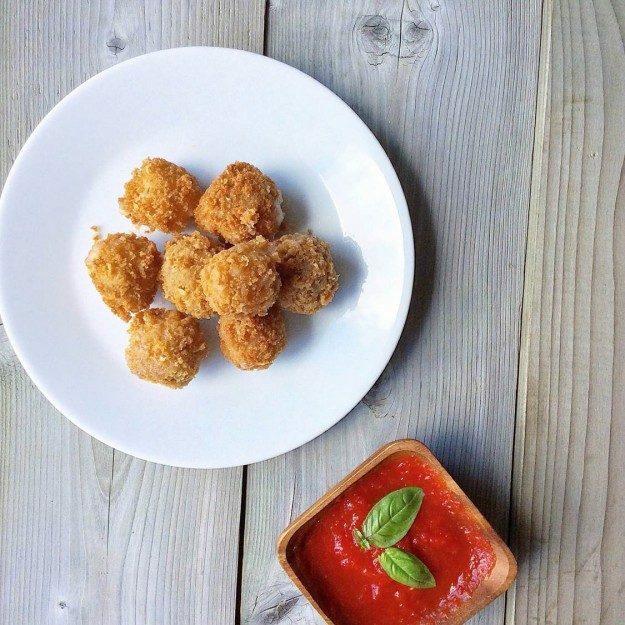 If you would like a thicker layer of breadcrumbs over the mozzarella balls, dip them a second time in the batter and again roll them in the breadcrumbs. 5. Place the balls in a plate or container and put them in the freezer to set for 10-15 minutes. 6. While you’re waiting, heat oil in a deep pan to 1″ depth over medium heat to a temperature of approximately 375. 7. Remove mozzarella balls from the freezer and carefully drop each ball in the oil until they are golden brown (approximately 2-3 minutes). 8. Remove the mozzarella balls from the oil and allow them to drain over some paper towel. 9. Serve immediately with some marinara sauce garnished with fresh basil on the side for dipping.